Katz begins with his own personal journey from chronic illness/weak voice to consistent wellness/strong voice… a story actually mirroring my own in many respects. Though medical science saved my life, complete physical healing and vocal reclamation was accomplished with alternative health practices and remedies. Katz, who is himself an accomplished vocalist, has researched the field of herbs, supplements and diet for himself and us. The book continues with a comprehensive description of individual healing herbs with suggested applications, appropriate warnings and contraindications. The next chapter offers herbal formulas and the corresponding conditions these combinations can help. A section on sinus health contains instructions for using herbs to netipot additives and more. I have done my share of herbal therapy but there are a ton of things I didn’t know in this guide! A list of prescription medications and drugs and their negative effects on the throat and voice is next – and quite illuminating. Katz then lists corresponding herbal remedies that have been shown to work for the respective conditions without the detrimental side effects of the medications. Tips to boost the immune system are also included. 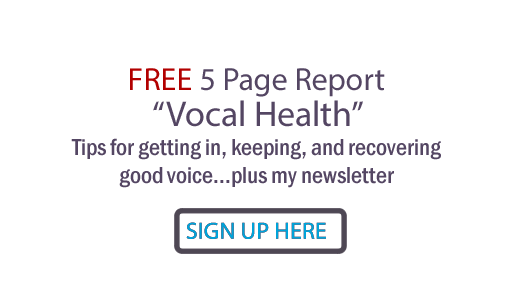 A very helpful chapter suggests a big list of ‘on the run’ foods for busy voice professionals. Again, I found a ton of ideas here that I’ll be using and recommending for all road warriors. The next chapter explains how to even out the acid/alkaline balance in the body, which is something I believe to be a core health concept.